Properties in Baraçal average 4.3 out of 5 stars. Country house surrounded by nature and the silence of a small village. Property 25: Country house surrounded by nature and the silence of a small village. CASA ESTRELA - LOFT - Rural sophistication in the Serra da Estrela. 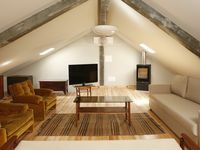 Property 34: CASA ESTRELA - LOFT - Rural sophistication in the Serra da Estrela. We stayed a week and found the house very modern in terms of amenities and very rustic in terms of architecture. We had never booked a longer stay but we really enjoy the Trancoso area and this proved to be a very handy location. It was great to have the quiet seclusion in the evenings after touring neighboring attractions during the day. Am&aacute;lia and her husband were very accommodating. It was a very pleasant stay.